Takahashi"- Little Kyoto" SUBPAGE | All Japan Kyoto Association"
Takahashi is often called “A Little Kyoto in the Bicchu Area.” The flat basin is surrounded by mountains and the Takahashi River slowly runs through the center of the city. Takahashi once flourished as a center of the Bicchu area and relics and the atmosphere from the olden times still remain here and there in the city. Bicchu Matsuyama Castle, which still retains its castle keep at the highest location of all castles in Japan, Raikyu-ji Temple, samurai residences, a Merchant Museum and many other cultural assets display the beauty of the Edo period along with Fukiya Furusato Village, designated as an important preservation district of historic buildings. This superb garden was designed by Enshu Kobori in his early stage as a gardener and is a national scenic beauty spot. Azalea bushes create such a beautiful view. An earthen wall on both sides of the street surround massive samurai residences which are open to the public. This particularly large traditional Japanese house on Honmachi Street belonged to the Ikegami Family. It is open as a free public rest place today. A former elementary school established in the Meiji period has been renovated as a local museum. A number of athletes will enjoy running through the historical castle town. Hina Ningyo dolls (Doll Set for girl’s celebration) are displayed in the local households and people welcome visitors who come to see the dolls. This festival is held in the Shirochi district which is the birthplace of Bucchu Kagura court music. The faint lights of fireflies after dark creates a mysterious and beautiful world. A firework festival with 300 years of history since the Edo period. A number of original fireworks adorn the night sky. The largest-scale summer festival with a 370-year-history in Takahashi City. 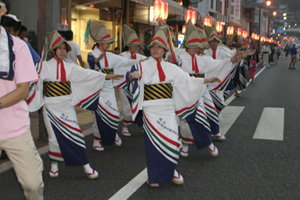 People join Ji-odori and Yatosa-odori local traditional dances and the city will become very festive. “Ebuta” is one of the most famous summer festivals of Takahashi City. Large puppets of cartoon characters will be lit-up and parade around the city. Traditional Japanese houses with beautiful wooden lattice walls will be illuminated with lantern lights. A variety of local specialties will be on sale. A number of food stalls are set up along the shrine approach. Many people enjoy visiting the festival. On the stage, local traditional performing arts along with a hero character show and other shows will be held. At the Kazaguruma Omoshiro Square, local specialties from the neighboring cities (Kochi, Kurashiki, Tottori) are sold. Traditional Japanese Doll Set for a girl’s celebration. Hina Ningyo dolls are decorated with beautiful woven textiles using gold yarns from Kyoto and are carefully made one by one by experienced craftsmen. Unique masks are cherished as an interior decoration. Made of paulownia wood. 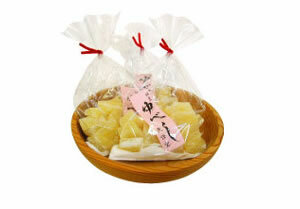 A traditional sweet which has been loved by people in Bicchu Matsuyama since the Edo period. It was offered to the Emperors of Meiji, Taisho and Showa periods and loved by all. There is a karst field spread around the upper stream of the Takahashi River, thus, the water of the river contains a lot of calcium. This is a secret of the sweet fish ayu’s good taste! Quality Japanese green tea has been produced in the Uji district in Takahashi for a long time. No food additives are used. One of the specialty items of Takahashi City. Many farms grow Pione and they are very sweet and juicy. Groups of local women use local agricultural crops and cook delicious dishes without food additives or coloring. Tea leaves harvested in Takahashi City are carefully fermented and become a tasty black tea with a good aroma and slight natural sweetness. The inside of this tomato is pink. High in sugar levels and lasts longer than other kinds of tomato. Red beans from Takahashi have a thinner skin, larger size, and more flavor. 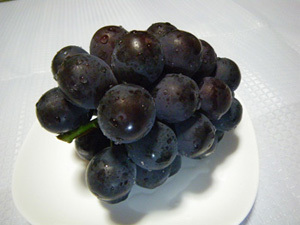 It is highly valued as the best choice for making tasty silky red bean paste for Japanese sweets. The crispy rice cracker looks like a mask of Bucchu Kagura, a traditional performing art of Takahashi City. Inside is ample amounts of tasty sweet red bean jam cooked with quality white sugar which takes many hours to make. In the late 70s to early 80s, Indian Fried Noodles (fried noodles flavored with curry) was a popular school lunch in Takahashi City. Tomato is added as another flavor and a new local soul food was born as the Indian Tomato Fried Noodle.